The core of Afropop Worldwide's spring 2004 program, "The Musical Legacy of Al-Andalus, Part 1: Europe," is a lengthy interview between Banning Eyre and Dwight Reynolds, Associate Professor in the Department of Religious Studies, Director of the Center for Middle East Studies, and Chair of Islamic and Near Eastern Studies at the University of California. Dwight is currently living in Granada, Spain, researching Andalusian music. He had far more to say in that conversation than we could fit into a one-hour program. Here's a complete transcript of the interview. Banning Eyre: Al-Andalus begins in 711 with an insurgence led not by Arabs but African Berbers. Who were these early insurgents? Dwight Reynolds: The way the Islamic conquest unfolded in the 7th century and early 8th century was that there were usually a smaller group of Arabs that would leave the Arab peninsula and arrive in some place like Egypt. They would conquer that place and build up a base there. Oftentimes, there would be a wave of conversions from whatever the original religion had been to Islam, and then using that new base of followers, they would move on further west, in this case, across North Africa. So as you move across North Africa 7th and early 8th century, you eventually get smaller and smaller groups of actual Arabs leading armies that are more and more of Berber ethnicity. B.E. : Who are the Berbers at this point? D.R. : First of all, the word Berber is the same we use in English, barbarian. This was a term first developed by the Greeks and adopted by the Romans and it really meant "those who speak gibberish." So it's a very negative term, and in modern north Africa, Berbers typically reject the term Berber, and try to use one of the different Berber words for these confederations, or tribes. One of the key things is that the Berbers don't speak the same language. They have large groups of confederations and clans that exist everywhere from Tunisia all the way through Algeria and Morocco. While there are some things that hold them together, there are also lots of distinguishing characteristics. So in some sense, to use the term Berber is first of all pejorative because we're calling them essentially barbarians, and second of all, it implies that they're one single people, and they're not. B.E. : That's a complex story we'll dig into more another time. Coming back to al-Andalus, things happen very quickly in that first century. It's about 100 years later that the legendary figure Ziryab arrives in Cordoba and begins one of the most artistically significant periods in Andalusian history. Tell us about the Cordoba he found. D.R. : Well, in that first century, Cordoba moves from being literally the wild west-- it's the frontier state of the expanding Islamic empire-- so it's really sort of an outpost. It's a provincial capital. The people who are appointed as governors there are actually Arabs from the East. They probably did not look forward to being stationed so far away from home in the far, far west. These governors often times only served a couple of years. So the key turning point was with the arrival of Abd al-Rahman I, who establishes Cordoba as a capital independent of the Abbasid empire. So when Ziryab arrives in 822, Cordoba has begun to shape itself not just as a provincial outpost but as a city that's going to claim itself as a metropolis, as a cosmopolitan center. B.E. : Of course, that's part of the reason Ziryab is brought in. It's part of the reason Abd al-Rahman comes. There is already this appetite to bring in talented people who might be floating around out there, disenfranchised. Is that fair to say? D.R. : Mmm. Yes. In the couple of decades before Ziryab arrived, we know from later historical sources that a small flow of famous intellectuals and artists from the Eastern Mediterranean were enticed out to the Iberian peninsula, to al-Andalus, to Cordoba and we have one historical source that gives us 86 different names of famous people who traveled to Cordoba and made their lives in the court there. Of those, eight are musicians, so we know that among the things that were of interest to the new regime in Cordoba was to establish a musical life in the court. A number of these were male singers and instrumentalists but many of them were also qiyan, which are singing girls [or female vocalists], and of them, there is one particular story that is quite interesting, and that is a female vocalist by the name of Qalam-- and Qalam means pen, like the pen you write with, in Arabic. We know that she is of actually of Navarese or Basque origin and that she was either sold into slavery or captured in a military campaign in Northern Spain. She was then shipped all the way across the Mediterranean to be trained in what at that point was the center of musical life in the east, which was the city of Medina. She became an accomplished singer, a lute player, recited poetry, a dancer, knew calligraphy, and even apparently shadow puppetry. And then she was eventually sold from Medina in the East back to the Iberian peninsula and then became one of the star singers in the court in Cordoba. B.E. : Now that is before Ziryab. D.R. : That is before Ziryab. And what is interesting about that is that that means a northern Spanish Christian woman was sent east and came back. So yes, she had all the Arab arts of singing, but it's very tempting to think that she might still have remembered from her youth some of the Christian songs, the music that she grew up with. That might well have been one of the things that made her popular. She had not only all of the expertise of the Arab style but perhaps could also present Christian music right there in the heart of the court of Cordoba. B.E. : There is a famous quote by al-Tifashi, I believe, that talks about a combination of the music of East and West that is unique to Andalusia. But then, tantalizing, he doesn't tell us much about what it was like. So we're left with this clear knowledge that these musical traditions were flowing together, but we don't have a clear idea of what the result was. B.E. : Before we talk about Ziryab, a question about the Umayyads. Abd al-Rahman I is embraced in Spain, after his family was rejected in the east, and all this so near after the death of the profit. How were the Umayyads perceived in al-Andalus after their tumultuous history in the East? D.R. : What happened in brief is this. The Umayyad house ended up becoming the rulers of the Islamic empire very quickly after the death of the Prophet Mohamed. They were from the heartland of the Arabian peninsula, and from that period of time up until 750, the capital was Damascus. The rule was very Arab, truly ethnically and linguistically Arab. Many of the people that had been sent out-- the troops, the governors, the various administrators who had been sent to al-Andalus-- were also Arabs from the Arabian peninsula. What happened was a change from a regime that was quite purely Arab to a regime, the Abbasid Dynasty, which was from further north and further east, and which had strong associations with Persian language and Persian culture. What happens in 750 when the Abbasids take over from the Umayyads is that we suddenly have a huge influx in music and in poetry and in architecture from the remnants of the Persian Empire. The Umayyads were killed off in a dramatic moment where the Abbasids literally invited all of the Umayyad family to a gathering, a banquet, and slaughtered them all. The one figure, Abd al-Rahman I, who escaped then fled from the East to North Africa. The reason he did that is that his mother was actually from a Berber tribe in Morocco. It's completely logical that after having his complete family killed, and not having an army or supporters to call upon, he fled to the one place that he would be most likely to find support, and that is to his mother's Berber tribe in North Africa. And from there, he eventually moved on to al-Andalus. When he arrived in al-Andalus, he met of course Arabs from the Arabian peninsula, many of whom would have been against the change of power from the Umayyads to the Abbasids, the new regime that was more Persianate of culture. B.E. : So that helps explain why he rose so quickly in al-Andalus. Let's shift to the cultural dimension now. Tell us. Who was Ziryab? D.R. : Well, interestingly enough, we have three different biographies of Ziryab from the medieval period and they all disagree as to who Ziryab was. Ziryab is both the historical person-- of that we're quite certain-- but he has also grown into an incredible legend. The legend is in some ways more exciting and more interesting than the historical personage. We often times have a very difficult time separating out what's true historically and what's the legend. What's probably true historically is that he was from the East. His name means "blackbird" or "lark." We are told he was given that name because he was dark of skin and had a beautiful voice. We don't know if he was actually from Baghdad, but some of the historical accounts tell us that he was actually the student of the most famous musician at that time, and he supposedly had a remarkable debut in front of the caliph. The caliph asked his chief musician to give him something new, a new voice, a new talent, and this young student Ziryab appeared and, according to one source, sang so beautifully and so impressed the caliph, that immediately after the performance the teacher took him aside and said, "This town ain't big enough for the two of us. And if you stay here, I won't be responsible for what happens to you," literally insinuating that he would be killed. And Ziryab supposedly flees to North Africa for fear of the wrath of his teacher. That may or may not be true. In any case, we do know that he arrives in Tunisia. Is a musician there and is essentially invited to come to Cordoba. He arrives in Cordoba and makes a tremendous hit. He arrives with everything that is chic and everything that is fashionable from the East. He has a sort of aura of the cosmopolitan about him. His clothes are different. His hairstyle is different. And as soon as he arrives he makes such a hit that everyone in the Cordoban court begins to copy him. For example, one of the historical sources tells us that before the arrival of Ziryab, all the people of al-Andalus, in the Cordoban court, wore their hair parted in the middle and hung down loose down to the shoulders, men and women. Ziryab had his hair cut with bangs down to his eyebrows, and cut straight across his forehead, and hair pulled back with little spit curls coming out from the sides of his ears. For Star Trek fans it's very clear that the Andalusis before the arrival of Ziryab were Klingons and that they quickly adopted the Romulan hairstyle, with the arrival of Ziryab. B.E. : I've read that the explanation for his dark complexion might be that he was African, possibly Berber. I know there is also the possibility of Persian ancestry. But is it a fair presumption that he was probably African? D.R. : Definitely. The remark that he was dark skinned seems to imply some sort of African origin or the descendent of a slave or mixed parentage. This would be quite possible. There were many African slaves, indentured servants in Baghdad at that time, and frankly there were many mixed parentages, not typically in marriages, but with courtesans and female vocalists, that sort of thing. So it's quite possible that he was fully or partially of African origin. B.E. : And the fact that he, like Abd al-Rahman, went to North Africa when he got in trouble might add credence to that argument. Yes? D.R. : It might. It might. But at the same time, the stories about him going to North Africa conflict, so we are very much not certain why he went to North Africa. B.E. : In terms of music, what was Ziryab's effect on Cordoba? D.R. : Along with all his other innovations, he, as I said, brought the latest material from the East, whether that was Baghdad or just from Tunis in North Africa. In legend and in at least some of the historical sources, he is portrayed as having not only a beautiful voice, but being a very innovative lutanist, player of the lute, and having a prodigious memory. He is said to have known 10,000 songs and their melodies by heart. He appears to have organized the repertory in some form, and that form might have been in the performance of certain types of suites with four different movements, to where he would typically sing this type of song first, and another type of song next, and then the third, and then the fourth. That's at least what one of the historical sources tell us. So it's a combination of arriving with all the latest stuff from the East, second being himself a very innovative performer and a very good performer-- he soon became the favorite of the ruler of Cordoba at that time. Although we also have a number of anecdotes that portray him very much as just the court singer not the superstar that we find in some of the later historical sources. B.E. : But he did start one of the first, or the first music conservatory in Europe. Yes? D.R. : I'm not sure we could call it a conservatory. When we talk about the school of Ziryab, we're probably not talking about a building with classrooms, or something that organized. But we do know he had ten children, eight daughters and two sons, all of whom were singers, all of whom were musicians, and we do know that he taught a number of musicians and trained a number of singers in Cordoba. We are told various things about how he would teach them. If a student didn't have the large vocal capacity, for instance, he would put pieces of wood in their jaw to force them to hold their mouth open. Or that he would tie a sash tightly around their waste in order to make them breathe in a particular way, and he would test incoming students by having them sing as loudly and as long a note as they possibly could to see whether they had lung capacity. But the degree to which we can call it a conservatory is pretty much up in the air. B.E. : In her book, The Ornament of the World, Maria Rosa Menocol celebrates a "culture of tolerance" in al-Andalus. Talk a little about that culture, when it existed, to what extent existed. Was the culture of tolerance real? D.R. : What people look at and call the culture of tolerance in al-Andalus is specifically one thing. They're always thinking about the three religions-- Judaism, Christianity and Islam-- and the degree to which there was a "convivencia," a living together, ebbs and flows in each of the different areas. It's almost impossible to generalize. You have to speak very carefully about one particular place, one particular time, under which ruler. Often times there would be a period of opening up that would be immediately followed-- either because of a change of ruler, or a reaction of one part of society or another-- and there would be horrible pogroms and there would be a moment of great restrictions. The thing we can say about the central period of the Umayyads in Cordoba is that, although Muslims were the dominant class, there was at least officially tolerance for the practice of Christianity and Judaism. But these minorities, the smaller religions, always were subjugated. There was always an upper class and other classes. At the same time, there was always a lot of difference within the Muslim community. You had upper classes within the Muslim community, and you had poor people and rural people who lived a very different life from urban people. So the term itself is really quite complicated and very difficult, but if there's one particular time that has the greatest number example of these, then yes, that's the 9th and 10th centuries, moving into the 11th century in various different parts of Al-Andalus. In other words, tolerance among the three religions just differs so greatly from one place to another and one time to another that it's very difficult to talk about a culture of tolerance that lasts for centuries. Certainly in Cordoba under the regimes of Abd al-Rahman II and Abd al-Rahman III, there is something that approximates a culture of tolerance, the famous Spain of the three cultures, much more so than at other times. B.E. : Telescoping the remaining history of al-Andalus, what are some other pockets you would look at for the culture of tolerance, particularly in leading to a period of great creative and especially musical innovations. Were there other important moments when we think of the real musical mother load of al-Andalus? D.R. : Well, if we're looking for the musical highlights of the history of al-Andalus, certainly, the period of Ziryab is one, the first. The next period is somewhat surprising and that's the 11th century when the empire breaks apart, and we refer to it as the period of the different groups or different parties, and each of the major cities develops into its own little kingdom with its own prince or its own governor or ruler. What happens is there's so much competition between these various patrons to build up an independent little court and culture that there's lots of work for musicians and lots of work for singers. And if you have a fight with your patron in Seville, well you can always go to another city and get employment there, very much like the situation in the Italian renaissance. Italy was completely fragmented into different city states, and yet it produced the Renaissance. And so this 11th century, this period when there were these little city states, just sort of the open market and the competition to establish your reputation by patronizing musicians and singers and poets, meant that it was a politically horrendous time and artistically, fat days for the musicians and poets. B.E. : Fascinating. That fragmentation actually created energy and opportunity. Now officially, Moorish Spain ended in 1492, but for about 250 years before that, it had been effectively reduced to the city of Granada and environs. What can we say about Granada during those years, particularly from the perspective of music culture? D.R. : We know very little about what was happening in the musical life of Granada during the last couple of centuries before 1492. But it's quite probable that that is the music tradition that has most strongly affected the Andalusian musical traditions of North Africa. So we sort of see it from behind, from later on, and look back at Granada, but when it comes to musical sources we know very little about what musical life was like in the kingdom of Granada, that small, little rump state in southern Spain. We have descriptions of different festivities that were held in the Alhambra, for example. We know that music was sung, and that dancers danced, and poets wrote poems, but when it comes to the music, we don't know exactly what type of music they were performing. We don't have enough details to characterize that period separately from what came before and what came after. B.E. : Granada becomes the focus of the nostalgia industry. "The Key to Granada." The Moor's Last Sigh, and all that. There's a lot of emotional energy focused on Granada, though we know less about it. D.R. : Yes. One of the interesting things to think about in terms of music during those last two-and-a-half centuries of Granada when it is a small and practically powerless state. It really only exists because the kings and queens of northern Spain are willing to let it exist. Because it is so much less of a political threat, in the north we suddenly find people who have great interest in Arab music, and we know through the 12th, 13th, 14th, and even 15th centuries, in the Christian courts of northern Spain they were importing Arab and Jewish musicians from the south and keeping them as musicians in their own courts, sometimes as many as 20 musicians of Muslim and Jewish origin were performing in various courts in Navarre, in Catalonia, in Castile, in Aragon, which is quite extraordinary, that Arab music was the fashion in the north. B.E. : Even as the crusades are unfolding and Spain is building up to the expulsions of Jews and Muslims, this is happening. That seems like a contradiction. D.R. : You have to realize that at that point, nobody was even conceiving yet of the expulsion. The expulsion was still centuries ahead in the aftermath of 1492. Conquering the territories and controlling the potential military threat of the Muslim kingdoms of the south was very much on everybody's mind. But in the 11th century, we have two Spanish kings in the north: Alfonso VI who conquers Toledo, and Pedro I of Aragon and Navarra, who probably only knew how to write in Arabic. Arab culture had penetrated that far and that completely and that far to the north. We find people in the 12th and 13th centuries, Christian kings building essentially Muslim style palaces, such as the Alcatrez Reales in Seville, essentially an entirely Islamic building built entirely by a Christian king. B.E. : How did this urge to the expulsion come up? How deep did it run in the psyche of the society and among the people? D.R. : There are actually two different expulsions. The first expulsion is the most famous one in 1492, and that is the expulsion of the Jews. The second expulsion doesn't occur until about 1610, and that is the expulsion of the Moriscos, the Muslims who were almost forcibly converted to Christianity if they wanted to stay in Spain. So there are two expulsions separated by more than a century. It's unclear when the idea first surfaces, but leading up to the expulsions, you have to realize that there were still large communities of various different sorts of Jews and Muslims living all the way in the north of Spain. For example, in 1610 and 1624, the final expulsion of Moriscos from Aragon, which is the kingdom in the far north, right up against the Pyrenees, 20% of the population of Aragon was expelled, and that's in the 1600s. So in different places, like in Valencia, the Moriscos were the majority of the population in rural areas, though not in the urban centers. And in Castile as well, we find different communities of Jews and of Moors. There are Muslims living in such cities as Avila, where we think there were about 3500 people where at one point, 1000 of them were Jews and about 1500 were Muslims from al-Andalus. Together, they outnumbered the Christians of Avila. So these communities were deeply rooted, in even the far north of Spain. B.E. : So is the idea of the expulsion itself an oversimplification. Was it really possible to expel so many people? D.R. : Some scholars suggest that the expulsion could and did only arise with the final political or military victory over the kingdom of Granada. It simply would not have been possible up to that point, and so that became the moment in which this idea, which may have been around for a long time-- we don't know-- was finally seized upon by their most Catholic majesties, Ferdinand and Isabella, and put into effect. B.E. : Talk about the Moriscos, especially at that time. To what extent is this a crypto-religious phenomenon where people are going through the motions of converting to Christianity while maintaining their true religion in secret? D.R. : In 1492, when Granada fell, there was an agreement that was signed, actually a series of agreements. Among the things that were promised by Ferdinand and Isabel, was that Muslims would be allowed to continue practicing their religion. That only lasted for ten years. In 1502, ten years after the fall of Granada, they basically said, "If you stay here in Spain, you must convert to Christianity. If not, you must leave." A large number of people left. They mostly went to North Africa. Those who stayed, who were tied to their families, their homes, their lands, their cities, their villages, had to at least publicly be Christians. And for the next couple of decades there was really an attempt to slowly assimilate this group. And once the Muslims became Christians, they were called Moriscos, so we're talking about people who are nominally Christian, and there were various attempts to teach them the teachings of Christianity and to allow them to practice their culture as they had. But then after awhile there begun to be stricter and stricter rules about what they were allowed to do. One of the things that was outlawed in the mid-16th century was music, Arab music. It was against the law to speak Arabic. It became against the law to wear Middle Eastern clothing. And it became against the law to perform Arab music, that is, Muslim music. It's a fascinating moment, because what the Catholics are saying is that not only do you have to be a Christian, but that all of these cultural things such as the type of clothing you wear, the language you speak and the music you perform are actually part of the religion. They see that as actually tied to religious identity. We have one fascinating moment when a man from wealthy and established Morisca family in Granada attempts to challenge that. And he writes a memoriale, an epistle to the kings, trying to make the case that your clothing and your language don't determine your religion. He writes, for example: look, we wear this Middle Eastern clothing, but so do the Christians of places like Syria and Egypt. So clearly, clothing doesn't have to do with religion. And then he says, we speak Arabic, but so do the Christians of the Arab countries, so speaking Arabic doesn't mean that you're not a good Christian. Then he makes a long fascinating argument about music. He says, "Look when I was a child, and the first archbishop of Granada came to visit us, when he celebrated mass, because we didn't have a church organ, he asked the Moorish musicians to climb up into the choir and to perform Arab music while he presented the mass. Quite an amazing moment. B.E. : But he wasn't persuasive, I gather. D.R. : No. So finally, when these laws began to go into effect, basically outlawing the use of Arabic, and forcing people to change the clothing that they wore, and outlawing the performance of Arab music or Andalusian music, there were rebellions. There was a great rebellion in the city of Granada, and there was also a war, literally a war, that was fought in the Sierra Nevada mountains in the area on the south-facing side, called the al-Pujara. At the end of those wars, the period of tolerance had absolutely come to an end, and we not only have the Spanish Inquisition but we have heavier and heavier laws that are imposed upon the Morisco population trying to force them to become not just Christians, but to become Spanish, and to be in every way like the Christians of the rest of Spain. The Moriscos simply aren't able to assimilate fast enough, or chose not to assimilate-- they chose to resist-- and that eventually led in 1609 and 1610, to orders of expulsion first from Castile and then a few years later from Aragon. In some cases, as much as 20% of the population had to leave. In other places, only a few percent of the population had to leave, but there was a tremendous exodus, and all of those Moriscos-- some of whom no longer spoke Arabic, some of whom were good and heartfelt Christians-- then traveled to North Africa, and had an amazing history in North Africa over the next couple of centuries. So when we get to the program about Andalusian music in North Africa, that's a thread to pick up, because these are among the people who bring Andalusian music to North Africa. B.E. : Is it fair to say that the expulsion of the Moriscos reflected the fact that the laws weren't working? D.R. : Clearly there's a change in the concept of what it is to become a Christian. The idea of just becoming a Christian and practicing the religion publicly is no longer enough. All of these laws simply weren't having the effect that the monarchs wished. I often think that this period of time in Spain is very similar to what has happened to immigrant populations in the United States, and the push and pull that we've seen in our history about forcing people to assimilate into the melting pot, where everybody has to not only become an American but dress like an American or the stereotype of an American, of a WASP American-that everybody had to grow to look the same. It's the idea of 1950s culture, and when that simply couldn't be done, that led to the expulsions. B.E. : Fascinating. I want to come to this idea of denying this history in popular and official accounts. In looking at this, we're in the work of decoding what Ned Sublette calls a "self-inflicted amnesia," that has affected how, or even whether, this history has been told around the world ever since. Talk about that a little bit. D.R. 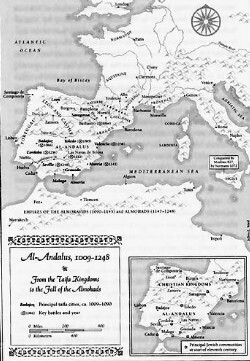 : Perhaps the most important thing to realize is that this battle for al-Andalus, about what type of society al-Andalus was-- was it tolerant or was it not? Were the expulsions necessary or were they not?-- that is a battle of modern politics. Both sides are motivated primarily by modern political considerations, and in some sense, we are using the medieval history of Spain to argue out now, the relationship between western Christianity and Middle Eastern and Eastern Islam. Those who are promoting a vision of al-Andalus as a tolerant paradise that has been lost are clearly those people who see the possibilities of "convivencia"-- living together-- now and in the future. And those people who go back to it, and there are a number of conservative commentators who go back to that period of time and reject the idea entirely and point out the level of violence and the various pogroms and expulsions etc., are precisely those people who think that "convivencia," or living together with different cultures, whether that be within a Europe that is now more culturally pluralistic, or in the larger sense of the West vs. Islam, these are the people who think that is not possible. B.E. : That's very important, and well taken. But is it still not fair to say that there has been a culture of forgetting in Spain, particularly under Franco? D.R. : Definitely for decades during the Franco regime in the 20th century, there was an institutional forgetting of the presence and contribution of the Jews and the presence and contribution of the Arabs. It is reflected in all sorts of official histories, particularly those that were taught in schools. Many of my Spanish friends tell me the type of history they were taught in public schools in Spain several decades ago, where the history of Spain was essentially of the Christian kingdoms of the north. Since the end of the Franco dictatorship, there has certainly been a move to open up again to recognize and in some cases to celebrate the entire Arab and Jewish contribution of al-Andalus. The interesting thing is, if you think of it in almost demographic terms, the Arabs-- that is, the ethnically Arab people of al-Andalus-were always a very small minority. And that means the rest of the people who were converts to Islam and the indigenous Christians were from Iberia. They were as Spanish as the Spanish are now. B.E. : Many others were Berbers from North Africa, right? D.R. : Yes, we have a small percentage of Arabs, a larger number of Berbers, and then the indigenous converts to Islam who are Iberians. This is before Spain, but they are Spaniards, if you will. And then there are the Christians, who are also Iberians. One of the most famous historians of Spanish history referred to the "reconquista," the re-conquest of the south, as "a civil war fought among Spaniards of different religions." That's a very dramatic rethinking of what happened. That's a negation of the idea, from a Spanish point of view, that we are the Spaniards, we are the Christians. And They-- capital "T"-- were other. They were something different and we had to get rid of them. The idea is that "We" as Spanish Christians now, in modern times, are not connected to "Them." But in a genealogical sense, the majority of those people who were expelled might have had not a drop of Arab or Berber blood. B.E. : So that means that a huge human flow of Europeans-- not just religion and culture, but European people-- went into North Africa during the second expulsion. B.E. : Well, we'll certainly come back to that. Let's move to music now, and look at some of the effects that this history of al-Andalus has had on European culture as we've experienced it ever since. Let's start with one of the most obvious examples, instruments. D.R. : Probably the most important single instrument to move from Arab culture into European culture was the lute, which in all of the European languages is called by names that derive from the Arabic world al oud, which means "the wooden instrument." The lute passes from southern Spain into northern Spain. It spreads throughout Europe. It becomes one of the major instruments all the way through the Renaissance. And it develops in Europe. It takes on new forms. It has many more strings and there are a number of critical changes such as the addition of frets because European music is played with chords and Arabic music is played with a single melodic line, and without chords. And of course, the different tuning systems. The lute comes to have a major impact on European instruments. Perhaps the next most important was the one known in Arabic as the rebab, in Spanish the reveille, and in English and French the rebec. It's a fiddle, a small violin type instrument. The importance of that instrument is not only that it becomes an important instrument throughout Europe, and you can see it in cathedrals and churches everywhere in Europe, and it's oftentimes the instrument that the angels are playing in various carvings that you find in these churches. The importance is not only the music itself, but that instrument or others like it introduced into the Iberian peninsula of a bowed string instrument. 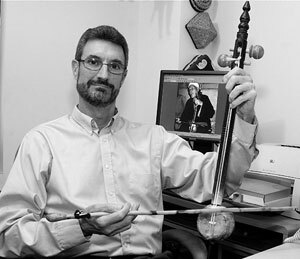 It seems so natural to us to think that string instruments can be either plucked or bowed, but in fact we don't have bowed instruments until about the 8th century, and it's an idea that begins in Central Asia and spreads out in several different directions and comes down into the Middle East and reaches Europe through two different passages. The Eastern passage is through the Byzantine Empire and through the Balkans, but the most important for Western music is really through the Iberian peninsula, through Spain that is, and then influencing France and Italy and other countries. The basic technique of bowing string instruments arrives in Europe in that period. Along with the lute and rebab, there are a number of types of flutes, there are several different types of drum. There are trumpets. In fact, it's very impressive that there are instruments of all of the different instrument types that move from the Arab culture in the south into the Christian culture in the north. One idea that is particularly intriguing is that it may be at about this time that the idea of reed instruments is reintroduced into Iberia. If there were reed instruments in Iberia during Roman times, we have very little or no documentation of it. They seem to have disappeared during the Visigothic period, the period just before the Arab arrival. So many of the standard works of organology-- that is, the study of musical instruments-- simply say that that the Arabs reintroduced reed instruments, instruments like our clarinet or oboe. So at this point in time, they also begin moving through Iberia and into the rest of Europe. B.E. : These are the shawms and hornpipes and such. Now I've read that this is one type of instrument that did not survive in the North African Andalusian music. Have I got that right? D.R. : Correct. I can give you a footnote on bowed instruments. Our oldest image of a bowed instrument in Europe is from a Mozarabic manuscript-- that is, a manuscript written by Christians who were Arabic speaking. And it's a manuscript of the apocalypse. We know it was written in first or second decade of the 10th century in the center of Spain. B.E. : A.J. Racy talks about the use of drones as an Arab contribution. I hear quite a lot of that in the recordings I've collected. Can you comment on that. D.R. : Drone is a technique that may be so old that we can never assign it an origin. It is very typically Arab, but I'm not really comfortable trying to pin that down. B.E. : What about drums? I have the sense that everybody got drums from Africa, including the Arabs. D.R. : Drums too are such a basic idea and such an ancient instrument that it's almost impossible to assign an origin, a geographic origin or a time period. For most cultures, we have no idea when they started using drums, or ideophones, the idea of taking two different blocks or solids and knocking them together. The contribution of the Arabs in al-Andalus is clear from one particular thing. Apparently people had not seen drums corps used in a military situation. Particularly the Almohads used performers of large drums, perhaps kettle drums, that they would use with the advancing troops. It's clear in several different texts that when Christians first heard these, it was a frightening sound, the idea of these advancing troops with these tremendous corps of huge kettle drums. B.E. : And this is the source of the timpani, right? B.E. : What about frame drums? Can those be tied more specifically to North Africa? D.R. : No. The Greeks and the Romans have a whole variety. B.E. : Do we know that there were drums played in Europe before al-Andalus? D.R. : I'm almost certain. Romans and Greeks. Yes. But then we have to look at what types of drums. B.E. : What was the Berbers' role in shaping the music of al-Andalus? D.R. : Yeah. Unfortunately, it's almost impossible to say anything. We have so few sources about Berber contributions in any of the fields. They're definitely there. We hear people refer to them in the historical sources about this community and that tribe, and an uprising of a group of Berber soldiers here or there. There was a Berber dynasty that ruled in Granada, but whatever contributions they might have made to the musical scene, almost invisible. If only we knew something about contribution, it would be great. Because they're certainly there. They have to have played some rule, and yet, we know virtually nothing. B.E. : Okay, enough instruments. Let's talk about people. Tell us this. Who were the qiyan? D.R. : The qiyan are female vocalists. They are professionals. They are trained. They are also for the most part slaves at least in the sense that they are owned by someone. Unfortunately the term "slave" in English evokes all sorts of things having to do with the history of the United States and the slave trade. This is more a system of indentured servitude. That is that, either people captured in wars, or parents selling children into this sort of indentured servitude, children and teenagers would be taken into the system, trained in singing, trained in dancing, trained in musical instruments, and those especially who had talent were then turned around and sold in very specialized markets for enormous prices. We have a text that tells us about the selling of female vocalists in al-Andalus in the middle ages and says that each one had a certificate that actually said exactly what her talents were, how many songs and melodies she knew, how many musical instruments she knew, and those who were quite good and acquired a certain amount of fame eventually could acquire enough money to buy their own freedom. But many others chose to remain within a household. Obviously the households that could afford these sorts of entertainments were quite wealthy and rather than be alone and on the streets, trying to support oneself by performing in various different unregulated ways, it was a far better life to be a star performer in a princely house, or the house of a nobleman or the house of a rich family where you would be taken care of even in your old age. B.E. : I gather from reading Henry George Farmer that this is a practice that predates Islam in Arab society. B.E. : But in al-Andalus, what can we say about the qiyan as vehicles of delivering culture. What was the effect on European music? D.R. : One of the things that you have to imagine in speaking about medieval Spain, al-Andalus and the northern Christian kingdoms, you have to realize that there were very strong links that went from one royal or noble family to the other, these courts in various parts of Spain. For example the rulers of al-Andalus, the Umayyads, many of them actually married Christian wives from the north. So that meant that a whole entourage would arrive and there would be a wedding and there would be family relations set up. These marriages were just like in other parts of Europe, contracted for political arrangements as often as they were for any type of love or attraction. Along with all of these official marriages and engagements, it also happened in the other direction. We know, for instance, of a Muslim princess who married a Christian king and became a Christian to marry him. Along with all of those noble weddings, and royal weddings, there was the level of the professional performer. Some of these were the qiyan, the female vocalists. Others were professional instrumentalists and singers, some male, and in many cases, these professional musicians accompanied a woman who was going off to be married in one court or another. They were sometimes presented as gifts from one court to another. We have an interesting request from one northern Christian king to the ruler of Valencia at that time. Having heard of a very famous flute player, he asked that this flute player be sent to his court. The Muslim ruler of Valencia actually liked that flute player so much that he didn't want to send him, so instead he sent him a rebab player, and apparently the rebab player found favor with the Christian king, because the Christian king immediately took him into his court and gave him a large annual salary, and he apparently remained there for the rest of his life. So they moved not only as professionals. They moved as gifts. And then in some very interesting ways, they may have carried Arabic music into the far northern reaches of Spain and even into southern France. In one particularly interesting exchange, there was a battle for a small city in the north of Spain, at that time held by the Muslims, called Barbastro. This takes place in 1064. And we have two stories that come out of this battle for Barbastro that are very, very interesting. The first is that we know that among the major Christian nobles fighting in this battle was William VIII of Aquitaine. And he being one of the major nobles would have received a share of the booty, the prize, after the city fell. The Christian sources tell us that nearly 2000 female slaves or singing girls were captured in that battle. So it's quite probable that William VIII actually went home with a number of these singing girls, these professional female vocalists, as part of his share of the booty after this battle. What's important is that he's not only William VIII of Aqutaine, but he's the father of William IX who is typically referred to as the first troubadour. So it's quite possible that William IX of Aquitaine, the first troubadour who began composing the songs of the troubadours in right about the year 1100, not only grew up in a house where there might have been female Arab vocalists, but since his father died when he was still a teenager, during his youth, he was actually the master of the household that had professional, female, Arab vocalists from the battle of Barbastro. The other story comes to us from Muslim chronicles, and it's equally intriguing. One Muslim noble having had to abandon the city very quickly at the fall of the city of Barbastro at the arrival of the Christian forces, had abandoned his household and his two daughters in the city. After the fall of Barbastro, he then wanted to ascertain what had happened to his two daughters, and if they had been taken captive, then he would pay a ransom to free them and bring them out as well. So he turned to a Jew. Jews often acted as go-betweens between the Muslims and the Christians in these events. So the Arabic speaking Jew went into the city of Barbastro, located the house of the Muslim gentleman who had asked him to do this. When he arrives, he knocks on the door and is let in and he sees a scene that is for him utterly astonishing. First of all, the house has been taken over by a Christian nobleman, who has taken this as part of his booty. The Christian nobleman has dressed himself in Arab clothes, the clothes of the Muslim gentleman that is trying to free his daughters. Not only is he lying around there dressed in his Arab clothes, he's there with the two daughters, and he's having one of the two daughters perform on the lute and sing to him in Arabic. In the account, we hear that the Jew says, 'and even though he knew no Arabic, and could not understand the song, he wept at the beauty of the singing. And the Jew left, amazed at what he had seen. And then we also find out, even more astonishing, is that the Christian nobleman had taken the daughter of this Muslim gentleman as his wife, and so she could not be bought free. B.E. : Well, we are a long way from expulsions at this point, aren't we? Let's stay with the troubadours. First of all, who are they? D.R. : Basically, the troubadours are a type of singer that emerge right about the year 1100 in southern France, the area that we call Ocitania. It's sort of a larger version of Provence. It stretches all the way to the Atlantic Ocean in the west. This was a new, dramatically different type of poetry in that it was lyric poetry rather than epic poetry and chanson de geste and other types of genres that were more popular in the era just up to that point. They were definitely sung, not just poems, but songs. They had as a central theme, a theme of joy and love, but there are several different tropes or motifs in that concept of love that are new and unusual from the European perspective. The singer, the troubadour himself, is usually completely separated from his beloved. She is often a noble woman whom he praises for his virtue and her looks, of course. He as the lover is pining away. They speak of love as a sickness, love as a madness. But it's pleasurable pain, of course, because to live without love would be even worse than to live with unrequited love. They portray themselves as being near to death; they see hallucinating visions; they talk about themselves as vassals or servants of their beloved. They also put together a small collection of characters having to do with these love stories. There's always the lover, of course, and there's the beloved-- this noble woman to whom he is addressing his poem-- but there is also sort of a guardian, watcher figure, and another figure that we might call in English the slanderer, someone who tell their secret and reveal their love. The slanderer might start gossip and rumors that would then, of course, be the end of their love affair. There's often sometimes a messenger who carries messages back and forth between the lovers. There's also a very strong focus on the feelings of the lover. Even though he speaks constantly of the woman with whom he is in love, the focal point is definitely what he is feeling, his pleasurable pain, his pining, and his emotional state. B.E. : The way you describe that sounds very reminiscent of Arab love poetry that we associate with Sufism, where there's this transposition of spiritual longing into an impossible love scenario. Do we think this is the result of some sort of cultural transmission from Arab al-Andalus? D.R. : Well, whether the troubadour tradition derives from the Arabic lyric tradition is probably one of the most conflicted academic questions of at least the last century. Those who work from the question primarily from the European side, that is scholars of Romance languages and of Latin, see the troubadours as, yes, something new and innovative, but they see the origins of all of this as springing from popular lyric poetry, which we do not have in writing, do not have historical documentation of, but which clearly for them existed as a sub-stratum to high Latin poetry. People who have worked primarily with the Arabic tradition look at troubadour poetry and see just an astonishing number of parallels. All of these elements that I've just listed are found in very typical Arabic love poetry. So from an Arabist point of view, it's almost impossible to think that all of these different themes, all of these different motifs and tropes could have sprung up completely independently in southern France without having some kind of contact with the Arabic tradition. Beyond the matter of themes, there are also questions of form that suggest there might have been a connection. These are stanzaic poems, they have end rhyme, and they are sometimes rhymed in fantastic ways where the troubadour has tried to put together the most fascinating and interesting rhymes possible. These are also characteristics of the Arabic tradition. B.E. : We'll probably never really know the truth, but maybe it's one of those situations where both sides are right. D.R. : Let me give you one other little riff. One of the most interesting things about the troubadour poetry is that it is rhymed in the way that we now think of as completely normal, and that is with end rhyme, rhyming syllables at the very end of the verse. Greek poetry did not have rhyme. Classical Latin poetry did not have rhyme. The Hebrew of the Bible does not have rhyme, nor did Aramaic, nor any surrounding languages to north, such as the Germanic languages. The one culture in the millennium previous to the beginning of troubadour poetry, who practiced end rhyme as a standard form of poetry, were the Arabs. All Arabic poetry from the very beginnings of the tradition in the late 4th or 5th century has always had end rhyme, exactly the type of rhyme that we're used to thinking of as rhymed poetry. For us, it's almost astonishing to think that all the other cultures that we know of-ancient Greece, ancient Rome-did not use rhyme. But they didn't. It wasn't part of their poetic vocabulary. They sometimes used rhyme as an occasional decoration, but they never used it to structure an entire poem. So it's quite probable that the Arabs introduced end rhyme as a structural concept into the literatures of Europe. In the 9th century in Cordoba, the bishop of Cordoba wrote a very famous complaint about the fact that all the Christians of Cordoba are losing their Latin. He says they're scarcely capable of writing a letter to a friend in Latin, but they are all enthusiastic writers of Arabic prose and Arabic poetry, and then he launches into a description of what he means by "Arabic poetry." He says that they all know how to end verses in a single letter, the way the Arabs do. They know how to write this poetry so well that they often times write better poems than the Arabs themselves. The interesting thing is he has to actually stop and explain to his audience what end rhyme is. He's saying this in about 850, the middle of the 9th century in Cordoba. B.E. : Talk a bit more about Cordoba and the attractiveness it held at that time, with all its cultural effervescence. The libraries created in al-Andalus were the biggest in Europe. This was the intellectual and creative center of the world pretty much, wasn't it? D.R. : Certainly, in its heyday, Cordoba was the most exciting intellectual center in all of the western world. It was probably the biggest city in all of Europe. It certainly had the largest libraries. It had a level of learning both scientific and literary that was absolutely astonishing to people who came and visited it. If we think about the year 1000, a century before the troubadours began to write their poems and sing their songs. The person who is Pope in the year 1000 is Pope Sylvester. Now Pope Sylvester was actually originally from Aurillac, in the heart of the troubadour country. He had gone as a young man to Barcelona to study, and from there, he went south and studied in Cordoba and Seville. So he almost certainly knew Arabic. He studied mathematics, the sciences, mechanics. Whether it's a legend or not, he is credited with introducing Arabic numerals and the decimal system to Europe. He is credited with having invented the pendulum clock, for example, and a host of other mechanical things, and introducing all forms of higher math into Europe. He actually becomes Pope. So in the year 1000, the pope spoke Arabic. B.E. : That's fantastic. I want to go back to poetry and song now and talk about two of the forms most strongly associated with al-Andalus, the muwashshaha and the zajal. D.R. : The great poetic innovation in al-Andalus in the Arabic tradition was the creation of two new genres of poetry, the muwashshaha and zajal. They are very similar forms. The easiest way to tell them apart is that the muwashshaha is primarily in classical Arabic and the zajal was written primarily in the colloquial Arabic of everyday speech. So a literary language, a high form and a more mundane, day-to-day speech. And these are completely new to Arabic poetry in one way, and that is in all Arabic poetry to that point, the standard form was that the end of every verse had the same rhyme: mono-end-rhyme. Every single verse rhymed with each other. Starting in the 9th century, in Arabic and Persian and Hebrew poetry, people began to play around with new arrangements of lines and rhymes and began to do things such as rhyme things AA, BB, CC, writing couplets. They experimented with a variety of different forms, but none of those forms really caught on. We have a few examples in each of these different languages. And then suddenly, this one song form emerges from al-Andalus, the muwashshaha and zajal tradition. These are stanzaic-- that is, there's a stanza or strophe, and you do a rhyme scheme, and then you stop, and then you do the next stanza with the same rhyme scheme. These songs are built on the idea of going back and forth between two different rhymes. So there's the section that rhymes on A and the section that rhymes on B. Very quickly they began adding all sorts of rhymes as decoration and suddenly you have these things where you have complex rhymes where almost every part of a sentence, every few words in a verse is part of a rhyme scheme. And this just takes the world by storm. It becomes extremely popular in al-Andalus. It spreads across north Africa. It spreads to the eastern Mediterranean. And this type of singing, the muwashshaha and zajal singing, has lived all the way to the present in all of these different countries. B.E. : When we hear contemporary performances of these songs, like those on Altramar's two Ibearian Garden albums, or The Splendour of Al Andalus by Calamus, or Begoña Olavide's Mudejar, how true are these? Were these notated melodically? Do we know what the instrumentation was? What can we say about the resemblance between these European performances and what might have happened in al-Andalus? D.R. : Well, one of the eternally frustrating aspects of studying Andalusian music is that although we have the words of the songs from the medieval period, we don't have the melodies. The music was never written down. So the only melodies that we have are those that were passed on orally and exist in the modern tradition. Now, it's not the case that there was simply a body of song created during the Middle Ages and passed down orally without change, without addition, and without forgetting anything. There have been tremendous changes. That we know. So we have a modern body of melody, and we have the text to which those melodies are sung nowadays. It's almost impossible to determine how old the melody is, although we can tell how old the text is. So when we listen to modern recordings, people have gone about this task of performing Andalusian music in a variety of different ways. One thing that people do is to perform a muwashshaha as it is sung in one of the modern Arab countries-- Morocco, Algeria, Tunisia, or Syria. What you are getting is much changed from the medieval period, though clearly a descendant from the medieval tradition. You get a text and a melody that the Arabs have put together. Another thing that has happened, and this is a fascinating idea, is that people have taken poems that they know to be medieval-- for example, the poems from walls of Alhambra palace-- and put them to melodies that they have found in Morocco or Tunisia or Syria. So we have a melody that is authentically part of the tradition, and we have a text that is definitely a medieval Andalusi poem, but that text has never been performed to that melody. The pairing of those two elements is part of what the modern interpreter, the modern musician, has done. Still other people take their inspiration from the Andalusian musical traditions we can listen to in the modern Arab world, and they take medieval poetry, for example, and they compose their own melodies to them. Sometimes if you open up the CD notes to something that is claiming to be Andalusi music, you might find that the text itself, the words, are authentically Andalusian, but that the musical composition is the inspiration of the tradition as interpreted by a modern performer, a modern composer. Then the far end of the spectrum is people who create their own text, their own music and sometimes market it as being Andalusian music when all we are really getting is modern compositions inspired by the Andalusian tradition. B.E. : That's a good summary of the recordings out there. I think the Mudejar album is an example of the second approach you describe, original texts paired with melodies found in North Africa. D.R. : Yes. One other possibility that that recording has is an approximation of authentic melody and authentic text. This comes to us through Christian northern Spain. Either during the medieval period, or in a later period, someone in the north transcribed a melody using western notation, and made a comment that this melody was originally an Arab melody. So we sometimes have, say, from the 16th century and even the beginning of the 17th century someone who has transcribed a melody for the vihuela or the guitar and noted for us that this was originally an Arab tune, but we don't have it's original text. So we can take that older Arab tune, as it was transcribed, of course by someone who may not have known the tradition well-- and who knows how accurate the transcription is?-- but we have something that's authentically Arab and Andalusian late medieval, and if you want to actually perform it, then you take a medieval text and put that on top. If you look in the Mudejar notes [Track 5, "Tres Morillas"], she has that the melody comes from the Cancionero de Uppsala, and that it was transcribed to be performed on the vihuela, but it is notated in the song book as being originally an Arab tune. B.E. : Mudejar. What does this mean? D.R. : The mudejars were the Muslims that ended up living under Christian governance, and that is because of the military conquest of the Iberian peninsula. They were in, for example, a town such as Toledo, which was taken by the Christian king, Alfonso VI, and they chose to stay in Toledo, even though they were ruled by a Christian king. They then became mudejars, which comes from an Arabic term that appears to be something like "restricted," "fenced in," even "domesticated." It's the type of thing they would use to separate out the concept of wild animals vs. domesticated animals on a farm. The implication is that they were living in a restricted environment, Muslims living under Christian rule. B.E. : That gives a good transition into talking about Cantigas of Santa Maria. This is a set of pieces commissioned, some perhaps even written, by Alfonso X, "el Sabio," a Christian king who maintained Muslim and Jewish musicians in his court. Why are the Cantigas important and what do they tell us? D.R. : First of all, this collection called las Cantigas of Santa Maria, attributed to Alfonso X, is one of the richest collections of songs from that period that we have. Not only does it give us the lyrics, but every single one of them is notated, and it's in a notation that we can actually understand to a great degree. In contrast, much of the notation that we have for the troubadours gives us where the melody goes up and down, but it gives us nothing to go on concerning the rhythm or the length of the notes. So we can't tell how long the note was held. In contrast, the notation to the cantigas is actually available to us and so we can actually perform approximations of those melodies. It's a rich and wonderful songbook. It has a notation system that we can actually understand. And even more so, it has a series of beautifully crafted miniatures, little paintings, painted on the various pages, that give us some of the best images we have of medieval musical instruments and, quite famously, presents several images of Moors and Christians performing together. B.E. : I have found a wide range of Cantigas recordings, some involving Arab instruments, the oud and rebec and Arab percussion, others more European, one involving the Orchestra of Fez. Talk about the freedom musicians have now to interpret this unusual songbook. D.R. : Well, when you listen to recordings of modern performances of the cantigas, you're going to hear an entire spectrum of different styles. We know approximately what the melody was. We know nothing about the rhythm. We know somewhat what instruments were probably involved in the performances because we have the miniatures that actually give us pictures, images of those instruments. But at the same time, we really don't know what the style was, what it sounded like, what the timbre of the voices was. So those people who come to the Cantigas de Santa Maria primarily as a European group, interpreting early European music will very often portray those cantigas with the vocabulary that they have acquired as musicians of early European music. Other people are making choices realizing the cultural mixing that was going on specifically, right there, in Toledo, during Alfonso X's time, and taking their clues from the images, the miniatures that are in the manuscript itself. Some of these are choosing to use styles and timbres that are much more Middle Eastern. It's very intriguing for us to realize the degree to which we recognize a style of music by very superficial features, by the timbre of voice that's used for example, or by the type of instrument. So it's quite possible, and you can hear this in recordings of the cantigas, to take exactly the same melody and to sing it in a European style and it will sound to you like it could have been performed in Paris, and turn around and sing that same melody and use a consciously selected Arab style, and you'll think that it came right out of the Middle East. In fact, the melody has stayed the same, and it's really only the vocal technique and the timbre that have changed. So if you add the vocal technique and the timbre and chose Middle Eastern instruments, or European instruments, choose what we think medieval European rhythms might have been, or use Middle Eastern percussion instruments and choose modern Middle Eastern rhythms, you can see that this same piece of music can end up sounding to the average listener as if it came from two completely different continents. B.E. : That's fascinating. What can we say about the cultural environment in which the Cantigas were being created? D.R. : Toledo ended up being this fascinating mixing of cultures from the 11th century through to the time of Alfonso X. There were certainly communities of all three religions, Muslims, Christians and Jews. Before Alfonso VI actually captured Toledo, he was in the political outs in his kingdom, and he took refuge in Toledo and lived under Muslim patronage for several years before then going back to become the king of his own kingdom and eventually negotiating the fall, the turnover of Toledo. When he became king, he very much tried to keep the Muslim population and Jewish population in Toledo by offering them various privileges and rights and things like that. We know that when Alfonso VI the conqueror of Toledo arrived, Jews, Muslims and Christians all came out celebrating his arrival. But at the same time, we learn that some of the Mozarabs- -that is the Arabic-speaking Christians-- chose to accompany the Muslim ruler out of Toledo and take refuge in Valencia, another Muslim kingdom, rather than live under a Christian king, that is Alfonxo VI. By the time of Alfonxo X, of course, Toledo was very safely in Christian territories and it wasn't necessary to try to keep the Jewish and Muslim communities there in order to keep the city populated. If you had an unpopulated city, it was almost indefensible. You couldn't fight off armies that attempted to take it. Alfonso X lived in a very secure environment in Toledo, but he was one of the monarchs who was most involved in the cultural scene, promoting poetry, promoting the translation of scientific manuscripts, even manuscripts on such things as the playing of chess and other entertainments. We refer to the Toledan school of translation, which is not so much a reference to a single building, but rather just to a practice of many decades of translating manuscripts from Arabic into Castillian Spanish. B.E. : Antiquera's Cantigas notes say troubadour inheritance lasted much longer in Spain than France. Why is that important? D.R. : What happened in southern France in the early 13th century, there was an issue of religious heresy. A new religious movement sprang forth, referred to as the Cathars, and they had a version, perhaps slightly Christian, but essentially a very heterodox form of Christianity, or perhaps even a completely separate religion. The French king of the north led the Albigensian Crusade (1209-1230) in an attempt to stamp out this heresy, and in doing so, he also stamped out the old Occitanian culture or the old Provencal culture that had given birth to the troubadours. And so many of the singers and poets fled to Spain and Italy, where they continued singing and composing, but essentially in exile. We have what we call the Sicilian school of troubadour poetry on the Italian side, then in the northern courts of Spain, troubadours continued their activities for another century, whereas back in their old homeland France, it had all but been suppressed. B.E. : Let's talk about the Jews of al-Andalus. First of all, what is the origin of the word Sephardic, and what does it mean? D.R. : Well, Sepharad is the Hebrew word that came to be applied to Spain, and so the Sephardim are those Jews who are tied directly to at some point having lived in Spain. B.E. : Now, the Jews had been there quite a bit longer than the Arabs, and I understand they often served as intermediaries between the Muslim and Christian communities. Is that right? D.R. : We don't know when the very first Jewish communities arrived in Spain but it was certainly centuries before the Arabs arrived. They were very much present in Visigothic Spain-that is, the period before the Muslim conquest of Spain. During the Visigothic period, especially at the very end, there were a series of extremely harsh anti-Jewish laws passed, restricting people's right to work, to marry, to raise children. So it's not surprising that when the Muslim armies arrived, from the Jewish point of view, this was a very welcome development. So as a result, very quickly, the Jews allied themselves culturally with the Arabic-speaking Muslims and became utterly Arabized in language. The language of speech for the Jewish communities of southern Spain was Arabic for centuries upon centuries. At the same time, there was a limited amount of Hebrew literacy, and all those people who had a religious education were able to read Hebrew scripture. Some were able to compose Hebrew prose and even poetry, but the remarkable thing that happened was this. Hebrew poetry up to that point had only been religious. You did not discuss secular subjects in Hebrew poetry, because Hebrew was a sacred language. Arabs also had a sacred language-- Arabic is the language of God and also of the Koran for Muslims-- but they of course also wrote poetry on completely secular topics, on love, on drinking, on gardens. And this became so influential that a completely new school of Hebrew poetry emerged in southern Spain in medieval times. People often call it the Jewish Golden Age. Not only did the Jews take over many of the themes of Arabic poetry, but they actually took over the form, the rhyme schemes, the way the Arabs calculated the meters. In fact, our first organized grammars of the Hebrew language are essentially done by Jewish scholars in southern Spain who applied all of the rules of Arab grammar to Hebrew. So there's an intense mixing of the two cultures. That meant that Jews were native speakers of Arabic, and they also knew Hebrew. In many cases they ended up as a minority being close associates of the ruling powers, such as the prince, or the governor, and later the caliph, and in many cases, they were given tremendous responsibility, as ambassadors, as spokespersons. They moved between the cultures sometimes as merchants, sometimes simply as scholars moving from one Jewish community to another. B.E. : Before we go today, let's talk about flamenco. What can we say about the Andalusian or Arab origins of flamenco? D.R. : Perhaps the most interesting thing about the potential Arab relationship with flamenco is to realize that historically it is quite possible. We talked about who the Moriscos are, that is the Muslims who stayed behind in Spain and had to be converted in order to stay in Spain after 1502. The gypsies arrive in southern Spain at least by 1499, that is seven years after the fall of Granada. That seems to be our first clear reference to the arrival of the gypsies in Granada. It's a complaint by a bishop who says that they have arrived in the city. So during the 16th century, all of the 1500s, the Moriscos and the gypsies-- the gitanos-- lived as the marginalized social groups in the newly Christianized cities of southern Spain, such as Granada, Cadiz, etc. So there was a century of overlap. And we know that in many cases, specifically in Granada, that they actually lived in the same neighborhoods. Rather than trying to think of Arab music as the origin of flamenco, or even its influence on flamenco, it's probably better to just note and be interested in the many shared aspects that both of these traditions have. Some of these things are actually almost pan-Mediterranean. They're found in many different folk and popular musics, especially in North Africa and the southern Mediterranean areas of Europe. But certainly there is something very evocative about the similarity in vocal timbre and in performance style. Each of these traditions has what we might call free vocal style, the muwwal or the betin in Arabic, and the martinetas, and the deblas, and the saetas on the flamenco side, which are a capella singing by unaccompanied musicians, typically male musicians using a tight-throat singing style where they go very high in their register. Boy, you listen to a good muwwal from Egypt, and then a good saeta from southern Spain and it's almost impossible to think that there might not be some sort of connection. But the connection might not be direct. That is, we're not saying that this was the origin of that, but rather that there are certain aesthetic principles that are fairly widely held in the Mediterranean region. Another thing that's very striking is the relationship between the singer and his instrumentalist, typically a guitarist. That is that a flamenco singer typically sings his or her lyrics, the actual words, and the guitarist is almost inaudible, just striking a few chords, very delicately filling in, but is not very loud. And then as soon as the singer stops, then the guitarist has this moment in traditional singing-- what is called a falseta, or in Arabic would be called a lazima-- and that is to fill in the space between the singing. And so really, only one of them is performing at a time. While the singer is singing, the guitarist is doing something very, very discreet in the background and then surges forth in between the verses. That also is very reminiscent one style to the other. Even another aspect is the opening of a performance by singing nonsense syllables, such as "Ya-le-le-le-le-le." That appears to be truly a direct descendant from the Arabic tradition of beginning a song performance by singing, "Yalil, Yalil, Yalil," that is, "Oh, night. Oh, nighttime." And this seems to have carried over. There are musical/modal aspects that appear to be very reminiscent between the two. There are patterns such as at the end of phrases in flamenco singing, you have what is called ramate, the ending, which is very similar to the Arabic hafla. And of course, they're both monophonic, that is, single-melodic singing styles with no vocal harmony. You never have a choir singing counterpart or in harmony or performing chords with the vocalists. B.E. : When would we say when flamenco begins? D.R. : Well, it's almost impossible to pin down an origin for flamenco, and I have to say that flamenco has absorbed so many different influences as well. It's a hotly contested topic. Put it that way. We have references going back a couple of centuries. The song forms we have now probably emerged the way we know them now no earlier than the late 18th or early 19th centuries, though the tradition itself goes much further back. B.E. : Just a final thought about all these efforts to perform Andalusian music. I understand that this is a fairly recent development, maybe since the 1950s. D.R. : It's the Early Music movement, and obviously, by that, they meant early European music. It was based on the idea of wanting to use period instruments, and trying to recreate the performances as they might have been. They didn't start with medieval stuff. They said, "Hey wait a minute. We're performing Mozart with these huge symphony orchestras, and Mozart never had a huge symphony orchestra." So they started saying, "What was Mozart's orchestra like? Let's see. He didn't have trombones. So drop the trombone." This sort of thing, stopping and saying, "Music from different periods should sound different." B.E. : So before that, is it fair to say orchestras and ensembles had gotten away from using history as a guide. D.R. : In fact, they never had that idea. They never did it. You performed with the kind of orchestra that was there then. In the mid-19th century, you performed with a mid-19th century orchestra. B.E. : And that Early Music movement set up the environment where you could have all these efforts to imagine and perform Andalusian music. B.E. : Thanks so much, Dwight. You've given us a lot to think about. D.R. : Thank you. I look forward to hearing the show. NOTE: The map used in this web feature comes from "The Ornament of the World," a highly recommended book by Maria Rosa Menocal (Back Bay Books).